In our article published in “BioPharm International” we discuss the challenges facing shipments of Control Room Temperature (CRT) pharmaceutical products. Through a better understanding of heat-transfer principles, the effects of environmental temperatures, and the purpose of each packaging component we demonstrate how the development and procurement of thermally protective packaging system can be both cost effective and thermally efficient. Control-room-temperature (CRT) pharmaceutical products are the most abundant temperature-sensitive drugs on the market. They need to be maintained at room temperature during transportation and distribution but require the same attention for temperature maintenance as those that require more strict temperatures conditions, such as 35.6-46.4°F (28°C). The challenge with CRT products is maintaining the required temperature with package solutions and distribution methods that are minimal in cost as the majority of CRT products have low retail values. Over the past several years, there has been an increase in costly packaging solutions that promise temperature maintenance but offer little thermal protection. 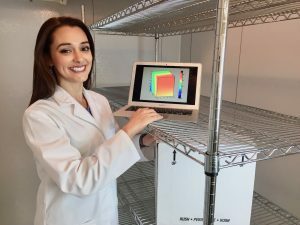 This article demonstrates how a better understanding of heat-transfer principles, the effects of environmental temperatures, and the purpose of each packaging component can make developing and shopping for a thermally protective packaging system more cost effective and thermally efficient. The functionality of an insulated packaging system relies on the principles of heat transfer. Heat is transferred from a system of higher temperature to a system of lower temperature; thus, hot always moves towards cold. Heat is transferred in three different modes: conduction, convection, and radiation (1). Heat conduction is the transfer of energy through surface contact. The rate at which conduction occurs is dependent on the geometry of the medium, the thermal conductivity of the material, the thickness of the material, and the temperature gradient. Convection is the transfer of energy between a solid surface and an adjacent moving liquid or gas. Natural or free convection occurs when the fluid motion is caused by temperature differences, which result in density changes because density decreases with increasing temperature. As warmer (and, thus, lighter) air rises from the surface of the solid, cooler and heavier air falls in order to fill in the space left by the rise of warmer air, creating natural convection currents. Radiation is the energy emitted by matter in the form of electromagnetic waves, which can transfer energy without the presence of a medium. Thermal radiation is governed by such important properties as reflectivity, absorptivity, and emissivity, which are dependent on surface properties and wavelengths, which are then dependent on temperature. Reflectivity is the radiation that is reflected off of a surface, which depends on the incoming direction, wavelength, and surface properties. Absorptivity is the fraction of radiation energy on a surface that is absorbed. Radiation occurs simultaneously with either conduction or convection, which are dependent on the presence or absence of fluid. The total heat transfer of a system is determined by the addition of radiation and conduction or convection effects. The predominant factor in determining the rate of temperature change is the difference in temperatures between the environment and the pharmaceutical product. Currently, most CRT products have a required temperature range of 59-77 °F (15-25 °C). This temperature range may seem easy to maintain but, when exposed to more extreme temperature ranges such as 10 °F (-12 °C) and 112 °F (45 °C), the rate at which the pharmaceutical reaches equilibrium with the environmental conditions occurs more quickly due to the greater difference in temperature. The surface area of a package exposed to the environment is a significant factor in determining the thermal efficiency of a packaging system. By minimizing the external packaging size, the thermal efficiency is optimized. Minimizing the surface area exposed to the environment reduces the area for heat transfer to occur. For example, if a pharmaceutical product can fit into a 6 x 6 x 6 in (15.2 x 15.2 x 15.2 cm) box but is packed into a 10 x 10 x 10 in (25.4 x 25.4 x 25.4 cm) box, the product will change temperature almost three times faster simply due to the increase in the external surface area of the box. The rate by which heat is gained or lost is mainly driven by the differential in temperature and surface area as well as the thermal energy of the entire packaging system, including the pharmaceutical product itself. The higher the thermal energy of a system, the more difficult it will be for the system to change temperature. The gain of heat into a packaging system will have less effect on the pharmaceutical’s temperature if the system can store more thermal energy. The heat capacities of packaging components and pharmaceutical products are also important factors when determining the rate of heat transfer, because it is the amount of heat energy required to change the temperature of an object by a given amount. Both the volume (mass) and heat capacity of the entire system are crucial in determining the duration of temperature maintenance. Table I shows the difference in heat capacity necessary to raise or lower a few common packaging components by 41°F (5°C). 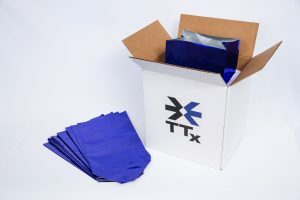 Insulated packages and pallet covers are the first items most people think about when it comes to packaging for temperature protection. These insulated containers and pallet covers have an important role in maintaining the temperature of pharmaceutical products. It is vital, however, to understand their purpose and how they cannot be the only means of temperature protection. Insulation, such as expanded polystyrene (EPS), helps reduce how much thermal energy enters or leaves the package due to the differential of temperature between the inside and outside. The insulation acts as a resistor that impedes heat transfer. Insulations are commonly rated on the amount of energy they resist per inch, called the R-value where the “R” stands for thermal resistance. An insulation with a high R-value means it will restrict heat transfer more than an insulation of a lower R-value. Increasing the thickness of an insulated material, however, does not mean the thermal resistance of the entire packaging system will increase by the same magnitude if the surface area increases due to the thicker insulation. Exposed surface area plays a significant role in the rate of heat transfer into or out of the package. For example, a company is currently using a one-inch (2.5 cm) thick EPS box with dimensions of 10x10x10 in (25.4 x 25.4 x 25.4 cm) with a surface area of 600 in 2 (0.387 m2). To improve the thermal performance of its packaging system, the company decides to select an EPS box with wall thickness of 1.5 in (3.8 cm) and exterior dimensions of 12 x 12 x 12 in (30.5 x 30.5 x 30.5 cm). Even though the insulation has been increased by 50%, the exposed surface are has also increased from 600 in2 (0.387 m2) to 864 in2 (0.557 m2), which does not provide a gain in heat transfer protection. Figure 1 shows how an increase in the insulation thickness alone does not always increase the thermal efficiency of a packaging solution since the surface area is also increased. Another component that leads to many misconceptions is the radiant barrier. Without the radiant barrier, the heat from radiation would be absorbed by the package, causing an increase in the surface temperature of the package that would be further transferred by conduction and/or convection to the inside of the package. This input from radiation can be significant and can drastically increase the overall temperature of the package. Many packages use metalized foil along with a small insulator, such as bubble wrap, as part of the thermal protection system. The metalized foil is perceived as a reflective material that would reduce the incoming heat caused by radiation. These metalized foils, however, are highly conductive materials that transfer the energy more quickly to the inside of the package. Metalized foils and covers do not have any significant insulation properties and thus do not have a significant R-value. A good reflective material should have a low thermal conductivity. The texture of the radiant barrier, as well as the surface finish, is also crucial in choosing a good radiant barrier. A white and glossy surface will reflect the electromagnetic waves more than will a dark matte surface. An embossed metal foil sheet absorbs more radiant energy and conducts the energy more quickly to the package than will a white flash spun, high-density polyethylene sheet. The metalized foil is a more conductive material with a textured surface with fewer reflective properties; in contrast, a polyethylene sheet is less conductive and has more reflective properties such as smoothness and a white color. Figure 2 illustrates that material type, color, and texture are important characteristics of a radiant barrier. Figure 2: The image on the left shows the surface temperature of a polyethylene cover and the right shows a metalized bubble foil cover. The pallets were exposed to the sun with air temperature of 68 °F (20 °C). Even though insulation, surface area, and reflectivity are important, none of these can completely stop heat transfer from the outside environment to pharmaceutical products. 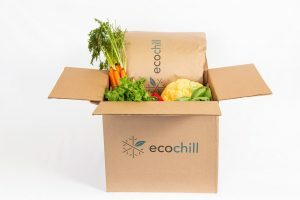 Even with the most effective packaging system, if the product inside has a small amount of thermal energy it can leave the necessary temperature range rather quickly. The only way to extend the protection time is to increase the amount of thermal energy stored inside the package. One of the most effective and economic methods of doing this is to use gel packs that are mainly composed of water. To see the effects of increasing the thermal energy, a 0.17 fl. oz (5 mL) liquid vial at 68 °F (20°C) was placed on a table in a room at 86 °F (30 °C). It will take 8 minutes for the vial to reach 77 °F (25 °C). If the vial is placed with a 24-oz (710-mL), room temperature gel pack, it will reach 77 °F (25 °C) in 10 hours. An optimal protective packaging system must balance insulation, surface area, reflectivity, and thermal energy. To determine the level of thermal protection needed for a shipment, it is necessary to know the required temperature range of the CRT products and understand the environmental temperatures to which the products will be exposed. Most CRT products have a required temperature range of 5977 °F (1525 °C). Recently, industry experts have recommended the new CRT temperature range should be 35.6-86 °F (230 °C). Because the rate of heat transfer is proportional to the temperature differential, the proposed new ranges could significantly affect the necessary amount of thermal protection. By changing the allowable temperature range of the CRT pharmaceutical, the level of packaging protection will be significantly reduced because the temperature differential between the pharmaceutical and the upper/lower limits of the environmental temperatures will be less. The most common extreme temperatures for parcel packages are typically seen during the final transportation segment and on the tarmac for air cargo pallets. Highs of around 113 °F (45 °C) can be seen during the summer and lows of around 23°F (-5 °C) are common in the winter. A product in the 5977 °F (1525 °C) range required a significant amount of thermal protection during the winter if the outside temperature was around 32°F (0°C). With the newly proposed range of 35.6-86°F (2-30 °C), the protection will only need to safeguard against a 3.6 °F (2 °C) temperature difference, which is a seven-fold reduction in the amount of heat transfer that must be managed. Most mail order/parcel shipments are sent in boxes or pouches. To represent an actual shipment, two 0.17 fl. oz (5 mL) liquid vials were packed into the following packages: a mylar mail order bag, 8 x 12 in. (20.3 x 30.5 cm), a metalized bubble pouch, two 10 oz (297 mL) gel packs at 68°F (20 °C) inside a mylar bag 10 x 10 x 10 in (25.4 x 25.4 x 25.4 cm), an EPS cooler with a 1.5-in (3.8 cm) thick wall containing bubble wrap as dunnage, and the same EPS cooler containing two 10 oz (297 mL) gel packs at 68 °F (20 °C) with bubble wrap as dunnage. These test packages were exposed to an environmental chamber at 14 °F (-10 °C). The temperature was measured inside of the liquid vial each minute. As seen in Figure 3, insulation and thermal energy play significant roles in determining the rate at which heat is transferred from the vials to the environment. The amount of thermal energy in the vials is small, resulting in rapid temperature changes. The vials in a mylar bag alone reach 35.6°F (2°C) in 1 hour, whereas the vials in the metalized bubble pouch reach 35.6°F (2°C) in 1.43 hours. The bubbles provide a small amount of insulation but do not offer additional protection, since the packages were not exposed to heat radiation. The package containing vials in an EPS box reached 35.6 °F (2 °C) in 1.7 hours. Even though EPS is a better insulator than bubble wrap or mylar, the amount of energy transmitted through the package is still significantly larger than the thermal energy stored in the vials, causing the vial temperature to drop rapidly as a result of the amount of energy lost by the vials. The mylar bag containing the vials between two 10 oz (297 ml) gel packs reached 35.6°F (2°C) in 2.4 hours. The heat transfer between the bag and the environment is high because of the lack of insulation, but the amount of energy stored in the gel packs is enough to keep the vials above 35.6 °F (2 °C) for 1.4 hours longer than the bag alone. The combination of the EPS box and gel packs demonstrates the synergy of the insulation container and the gel packs by providing protection for over 6 hours. It is important to know the environmental temperature to determine how many hours of protection are actually needed because each additional minute of protection comes at a cost (see Table II). Often extra insulation is not needed; instead, increasing the thermal energy of the system could provide the needed protection. However, there is a balance in the cost of insulation and extra thermal mass, depending on the mode of transportation. Increasing the thermal mass of a package may increase shipping charges, which could outweigh the benefits of using a lower-cost thermal mass as compared to the cost and weight of insulation. Pallet loads have a larger thermal mass compared to parcel packages because of the larger quantity of pharmaceutical products. However, in evaluating a thermal protection cover for pallet loads, it is important to look at the first points that reach the temperature limits, typically the outer surface. Solar radiation can be detrimental to a pallet load; therefore, a cover with low conductivity and high reflectivity is ideal. Surface temperatures as high as 140°F (60°C) have been recorded under insulated and dark colored covers when in the sun. Comparatively, a minimal increase in surface temperature was observed under a highly reflective cover. The heat-transfer rate through covers is much faster between the outside of the pallet compared to the inside of the pallet because the temperature difference between the environment and the inside surface of the cover is much greater. The products on the outer surface of the pallet perform similarly to a parcel shipment compared to the inside of the pallet, which will require significant time and temperature differences to increase in temperature. The test seen in Figure 4 was conducted in a temperature chamber without the effects of radiation to simplify the comparison of insulation materials. The pallets contained 55,000 vials containing 0.17 fl. oz (5 mL) of liquid. The temperatures were read at all eight corners of the pallet and inside the liquid. The test pallets were exposed to 113 °F (45 °C), with an initial temperature of 68 °F (20 °C). The following covers were tested: 0.25-inch (0.64-cm) thick metalized bubble wrap cover without a bottom, a 1.5 inch (3.8-cm) thick fiber filled insulated blanket without a bottom, and a 4 mil polyethylene sheet with a 1-inch (2.5-cm) air gap between the film and the pallet load that contained a bottom to fully enclose it to avoid air drafts from the outside. As seen on the graph, there is only one hour of additional protection when comparing the best-performing cover to the worst. Interestingly, the thick insulated blanket lasted only 15 minutes longer than a pallet fully wrapped in plastic. This demonstrated that air gaps can be a cost- effective, lightweight, and simple insulation (see Table III). A good understanding of the shipping environment (as well the purpose/benefits of each packaging component) will allow for the use of a packaging system that optimizes the size, weight, and cost. Too often, the thermal properties of one material can be misleading when looking at the overall effectiveness of a system; this can translate into the purchase and use of expensive, high R-value materials that can still fail to properly protect the products. Even an increase in the thickness of insulation is not directly proportional to a gain in temperature protection due to the increase in surface area. For many CRT products, the lack of thermal energy makes it difficult to protect against temperature fluctuations. By increasing the overall thermal energy of the package, the time the products are in range can be greatly increased. M. Germain, Unconventional Insulation Materials for the Shipment of Temperature Sensitive Pharmaceuticals. Master of Science Thesis, University of Florida; 2010.